Is social media in the workplace good or bad? If you’re like a lot of employers, you are not in favor of allowing, much less incorporating, social media into your company’s culture. Perhaps in your estimation, Twitter, Facebook and Instagram are time wasters with the propensity to dull an employee’s wits and cause him or her to mentally check out while at work. 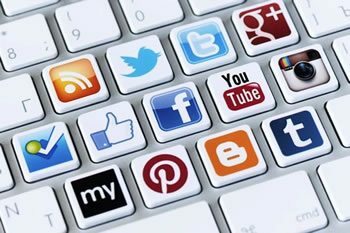 What are your thoughts on social media in the workplace? Is Social Media a Help or a Hindrance in the Workplace? There are a myriad of reasons why employers don’t want their employees surfing social media sites while at work. Most of these reasons are based on the faulty belief that an employee who socializes during work is ultimately prevented from accomplishing critical tasks. While this may be true in special cases, for the most part, it is not. Despite the bad rap social media gets in the professional realm, it actually can be a benefit to employees as well as employers. You may be wondering how in the world this could be true. Allow us to enlighten you: It is good for employees to take short breaks during the workday. If you, an employer, had a 15-minute break, what would you spend your time doing? If you’re similar to millions of others, probably checking your Facebook account. Believe it or not, it’s beneficial for employees to spend time on social media sites during breaks from work. Why? For one reason, they are able to do it seated at their workspace. At the break’s end, employees are refreshed and do not need to travel far to resume business. Can you see how this could benefit your company as well as fulfill your employees’ desires to use social media? Maybe you see the value in employees occasionally using social media at work but are hesitant to create a social media allowance policy for fear it will get abused. That’s an understandable concern. A great solution for an employer in this predicament is a social learning management system (LMS). LMSs make it possible for employees to utilize social media communication on an employer-approved platform and conduct it for professional purposes. How Does an LMS Facilitate Social Media in a Professional Setting? Are you under the impression that an eLearning system, or a social LMS, is only good for online training? If so, here’s some exciting news for you: social learning management systems have many functions besides those that are training-related. For example, certain LMSs facilitate monitored usage of social media in the workplace. eLearning system features such as realtime chat, video conferencing, screen sharing, mass distribution of company correspondence, and the ability to share information foster the use of social media in a professional setting. Also, personal profiles, a feature of many LMSs, are social media-friendly. Personal profiles are invaluable to workplaces because they comprise employee databases. Creating a personal profile on an LMS is similar to creating a Facebook profile – that’s why employees usually enjoy putting together their profile on a social learning management system. Not every social LMS features mobile learning. However, an LMS that does enables employees to work from any device with Internet connection and a web browser. This is great for those who want to connect with colleagues outside of business hours, or individuals who need to take work home with them. An LMS makes it possible to access data at any time, meaning employees always have the information and tools they need to complete work-related tasks. On the same device, employees can access social media within the parameters of what is allowed by their employer. Looking for an LMS that allows social media access and features mobile learning? If so, look no further than TOPYX. TOPYX is an award-winning learning management system that is conducive to social media. Employers as well as employees love TOPYX and its social features. Some employers firmly believe that social media should be allowed in the workplace; others strongly disagree. Regardless of where you fall on this spectrum, the truth remains: social media is here to stay, it can be beneficial professionally and employees want access to it. Implementing a social LMS causes employers AND employees to win.